Some pterosaurs were the largest flying animals ever seen on Earth. These extinct flying reptiles that lived above the dinosaurs' heads could grow wingspans of up to 11 metres and dominated the skies of the late Cretaceous period, the last age of the giant reptiles. Earlier pterosaurs are also known to have been as small as a metre across, but few such fossils from this period have been found. This has led to the idea that small-bodied pterosaurs disappeared because they were out-competed by early birds who forced them to evolve into much bigger animals. But an exciting new pterosaur fossil has added to the growing body of evidence that small pterosaurs did continue to exist alongside their much bigger cousins. The new find is not the prettiest of fossils. Discovered in British Columbia, Canada, and described in a paper in the journal Royal Society Open Science, it consists of a partial skeleton with a humerus (arm bone), some vertebrae, and some possible limb fragments. It was found on Hornby Island by a collector and volunteer, who then donated it to the Royal British Columbia Museum. Vertebrate fossils in this area are rare and, as the rock was laid down under the sea, fossils of land-based creatures are even more uncommon. The fact that the fossil has a notarium, a section of fused vertebrae found in later pterosaurs to help support flight and wing musculature, shows it is indeed a pterosaur and not a bird (fossils of which have also been recovered from Hornby Island). Because the specimen is incomplete, it’s a bit harder to pin down what type of pterosaur it is. But my colleagues and I concluded that it is most likely an azhdarchid pterosaur, from the same family as the larger animals. The exciting thing about this fossil is its size. With a humerus just 75 mm long, this little critter had a maximum wingspan of just 1.5 metres. That may seem big by modern standards, but against the 10-metre giants from this time it would seem pretty tiny. One question we had to answer was whether it was simply a baby. In order to determine the age of the animal, we looked at the microstructure of the humerus’s bone tissue. We took a very thin section of the bone and looked at it under polarised and non-polarised light. This revealed that the animal’s tissue was likely still growing but had already begun to slow down, suggesting it wasn’t a young animal. We also found evidence of secondary tissues laid down after the initial bone tissue; remodelling of bone showing it had changed; and a tissue layer that is only found in azhdarchid pterosaurs that are close to full grown. For this reason, we don’t think this animal would have grown much more, making it among the smallest pterosaurs that we know of living at the end of the Cretaceous period. Palaeontologists have had a big debate about what happened to pterosaurs during this time because few small fossils have been found. 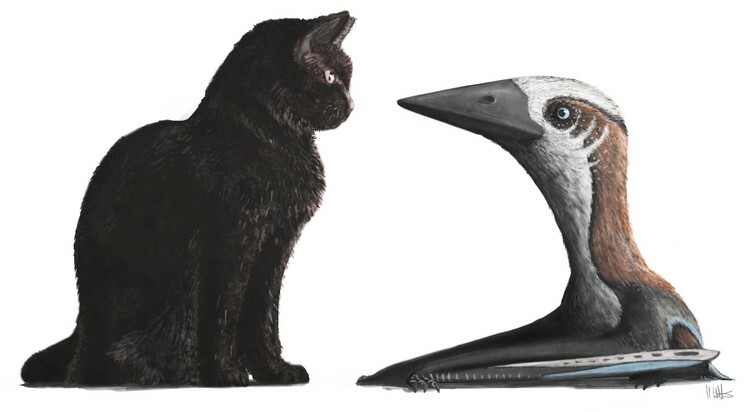 Older studies typically found no link between the decline of pterosaurs and the rise of birds, but recent work has suggested small pterosaurs just couldn’t compete with birds and only the biggest creatures survived. However, this new specimen adds to some previous finds suggesting that small-bodied pterosaurs did exist during this time – it’s just that their fossils have rarely been found. Pterosaur fossils in general are notoriously poorly preserved because their bones were hollow and more easily damaged. This bias against pterosaur preservation, combined with the fact that places like the Dinosaur Park Formation exhibit a documented preservation size bias against small animals, with small dinosaurs and vertebrates rarely being found, means the odds are stacked against a small pterosaur being preserved and then discovered. We’ve also found very few young, large-bodied pterosaurs for the same reasons. Elizabeth Martin-Silverstone, PhD Candidate in Palaeontology, University of Southampton.